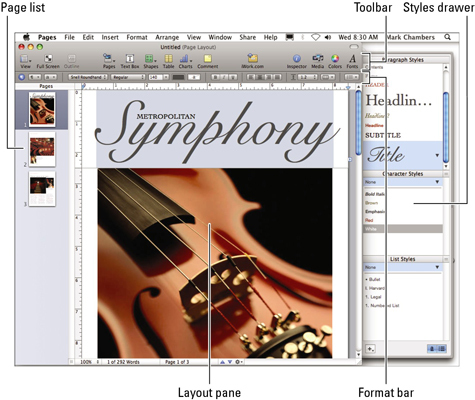 The Pages application offered by Mac OS X Snow Leopard meets all of your desktop publishing needs. If you feel that some (or all) of the text in your Pages document needs a facelift, you can format that text any way you like. Formatting lets you change the color, font family, character size, and attributes as necessary. Use the Format bar. The Format bar appears directly underneath the Pages toolbar. Click to select a font control to display a pop-up menu and then click your choice. Spruce up text formatting from the Format bar. For example, click the Font Family button and you can change the font family from Arial to a more daring font. You can also select characteristics such as the font’s background color (perfect for “highlighting” items) or choose italicizing or bolding. The Format Bar also provides buttons for text alignment (Align Left, Center, Align Right, and Justify). Use the Format menu. Most controls on the Format Bar are also available from the Format menu. Click Format and hover the mouse cursor over the Font menu item, and you can then apply bolding, italicizing, and underlining to the selected text. You can also make the text bigger or smaller. To change the alignment from the Format menu, click Format and hover the mouse cursor over the Text menu item.